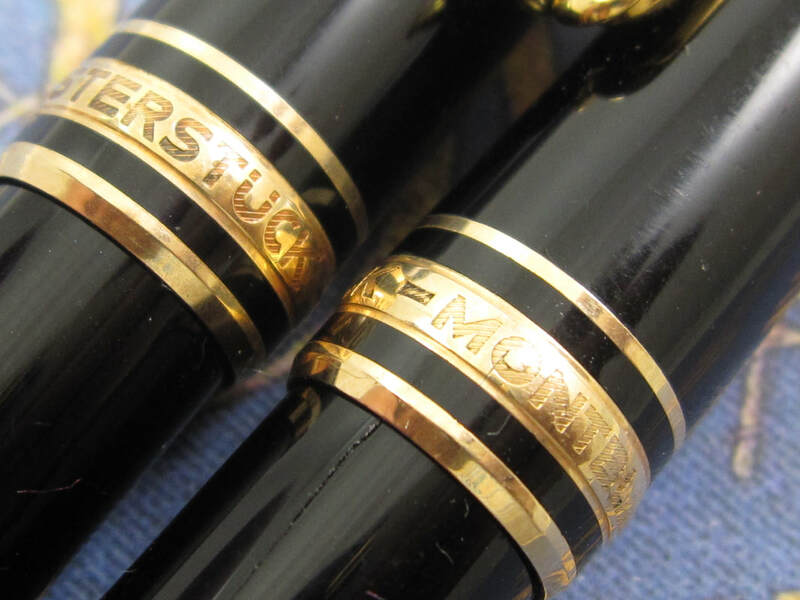 COMMENTS: Montblanc Meisterstuck 149 in black resin and gold trim. 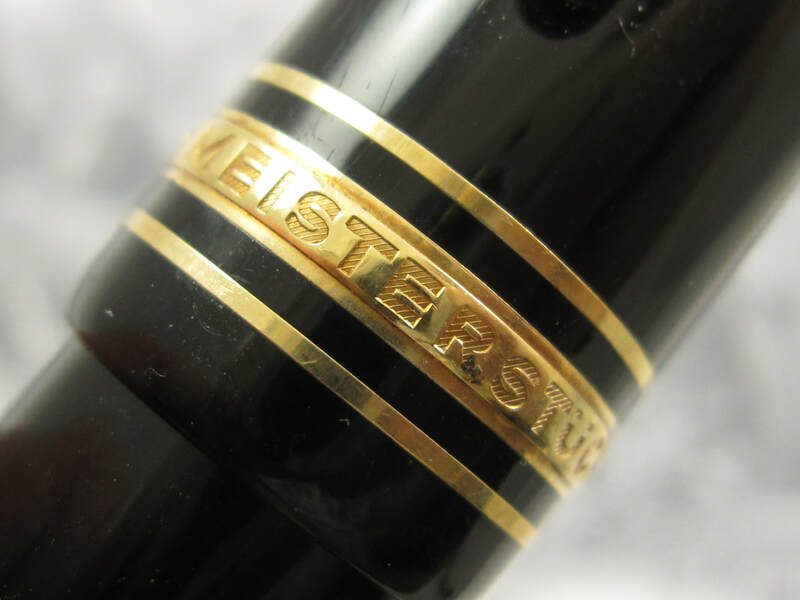 The 149 is an oversized pen with very wide girth (diameter) and the grand daddy in the Meisterstuck series. 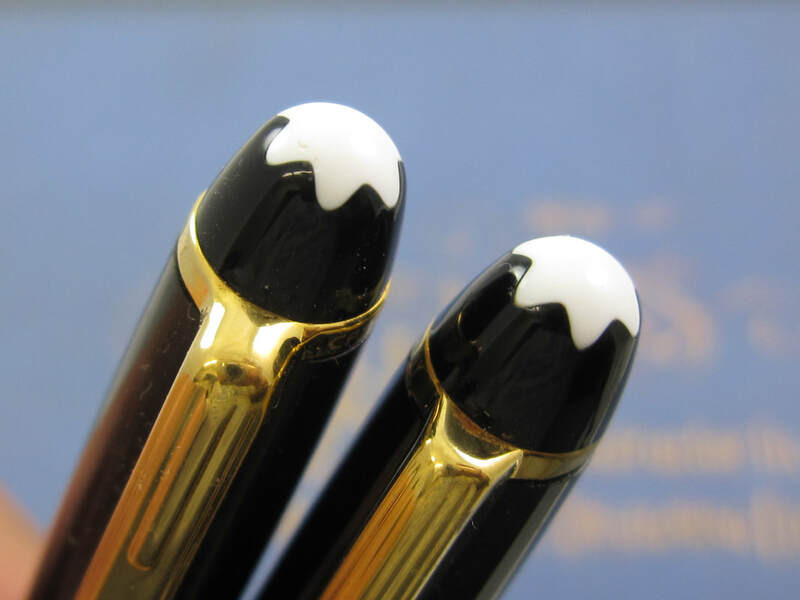 The 149 model is an icon among Montblanc pens. 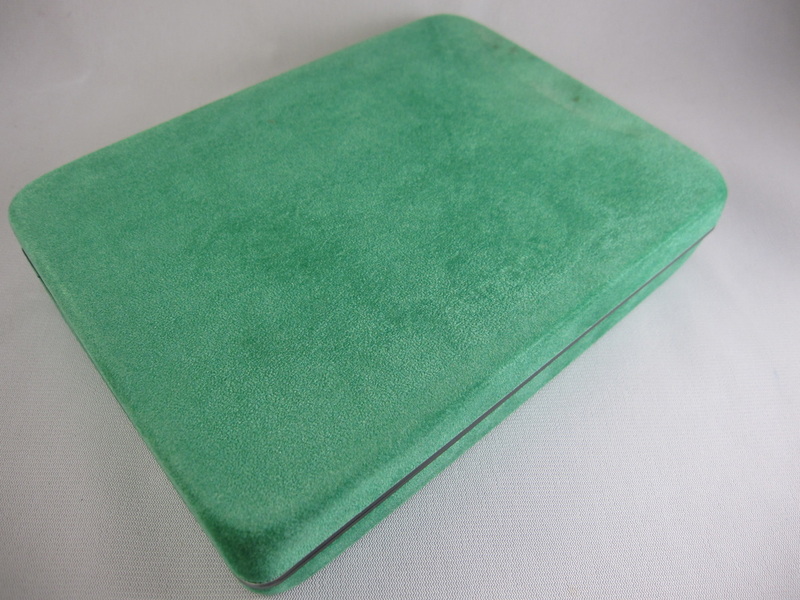 This model has been manufactured since the 1950s and very little changes have been made to this model over the decades. 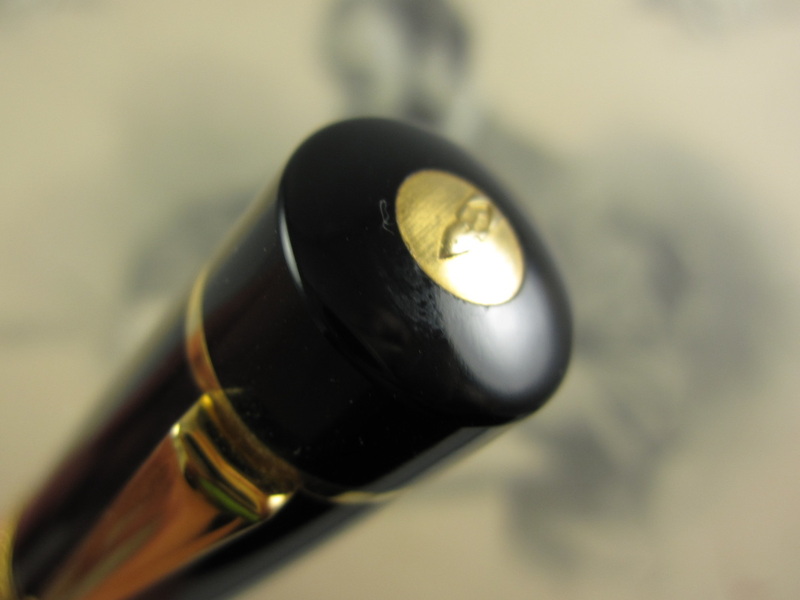 Fitted with its correct 14k dual-tone oversized Montblanc 4810 nib that writes a medium/broad line. Professionally adjusted nib, ultra smooth nib, and a phenomenal writer. Plastic feed. 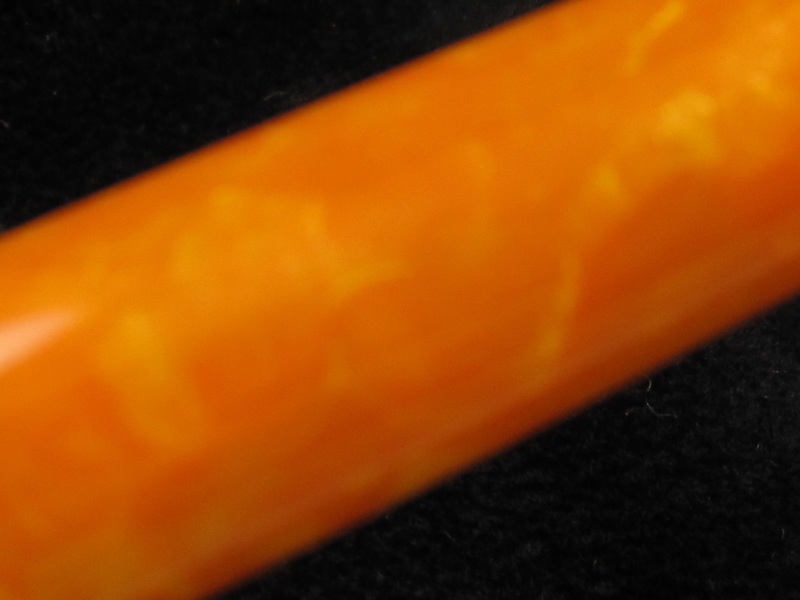 This pen is used, but other than showing some light exterior scratches, it is in amazing condition. 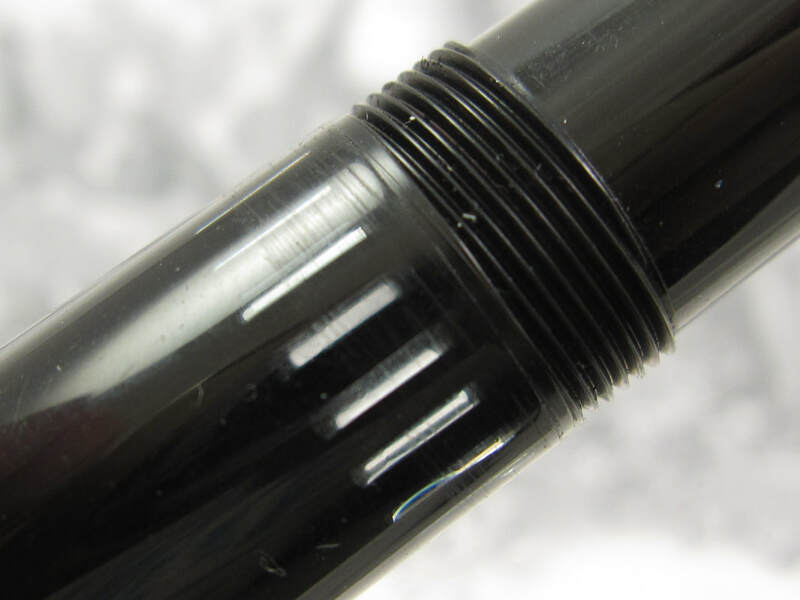 Piston filling mechanism and clear small windows by the section to see the ink levels in the pen. Made in Germany c.2000. 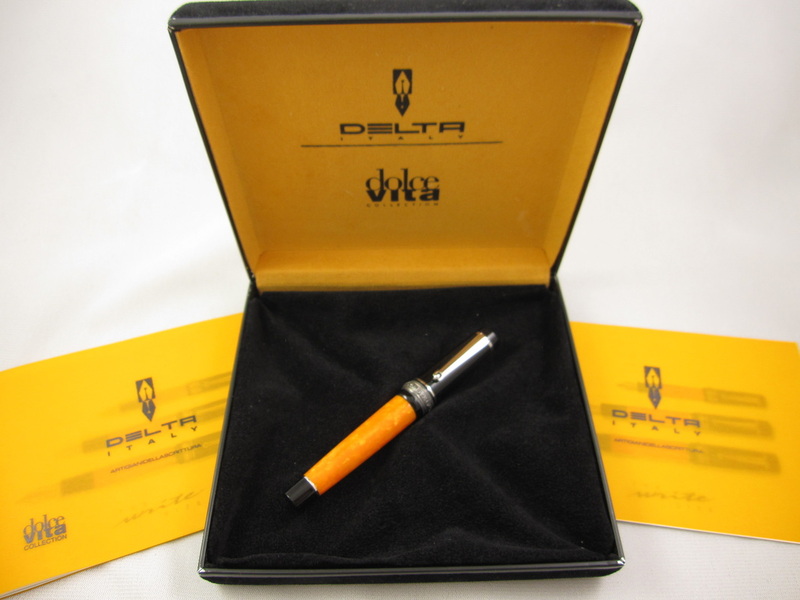 Current MSRP for this pen is $935. Get yours gently used for $470! NEAR MINT PEN SET !!! 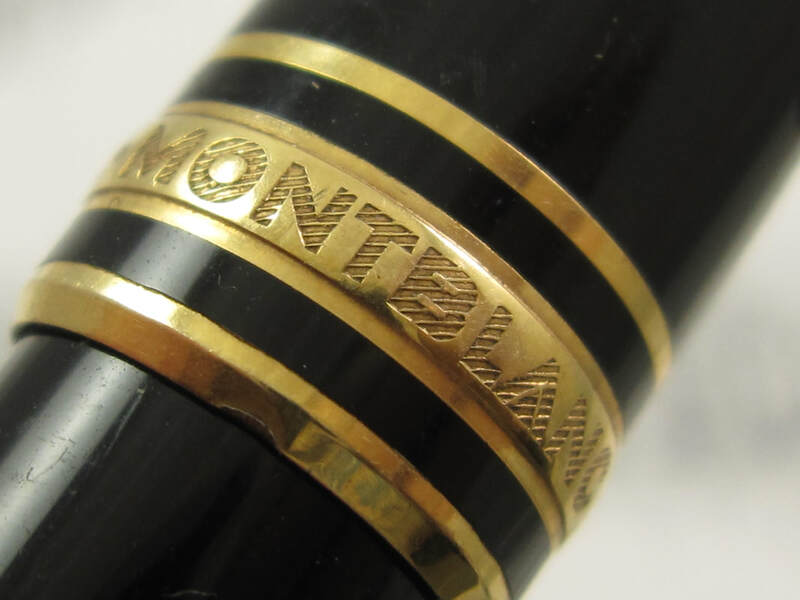 COMMENTS: Montblanc Classique pen set in black resin and gold trim. 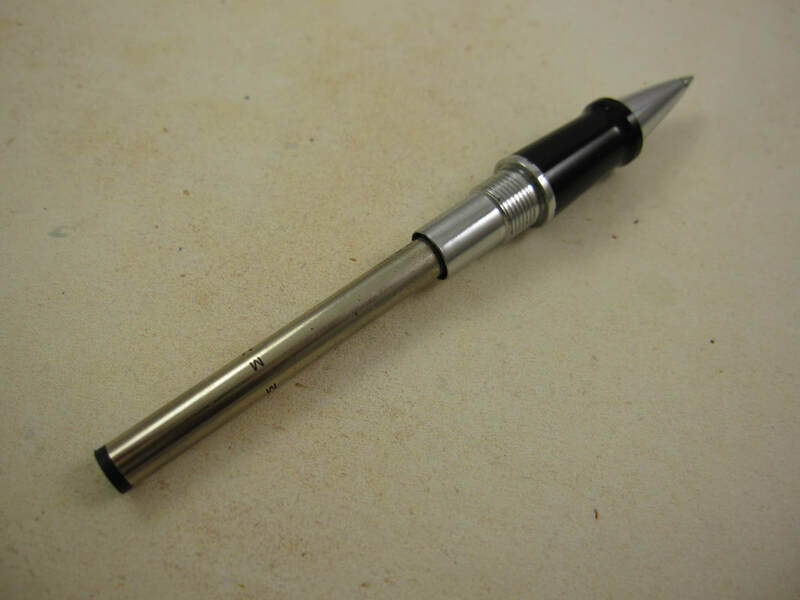 Pen set is comprised of a ball point and its matching mechanical pencil. Used but in near mint pen set. Made in Germany. 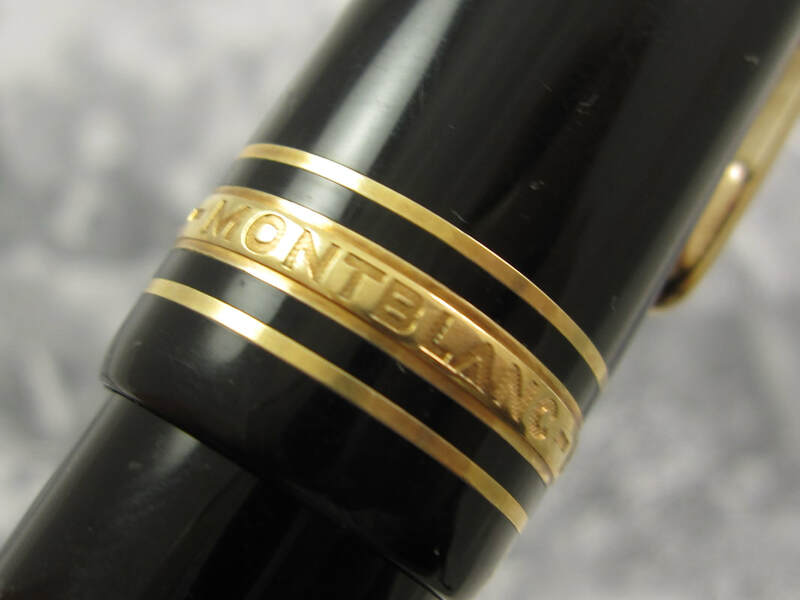 Currently manufactured and sold items by the Montblanc Pen Company. Current MSRP for these items is about $420 each. Get yours gently used for $295 each or buy both for $550! 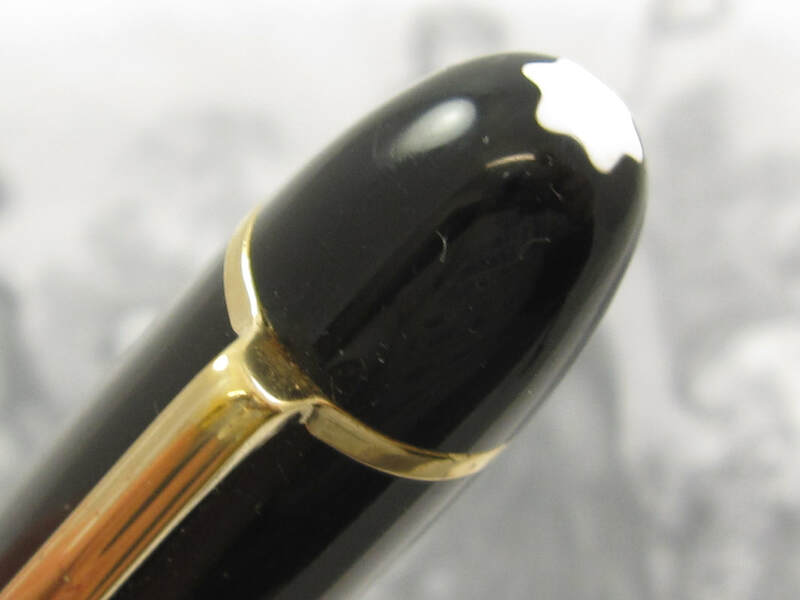 COMMENTS: Montblanc Classique fountain pen in black resin and gold trim. 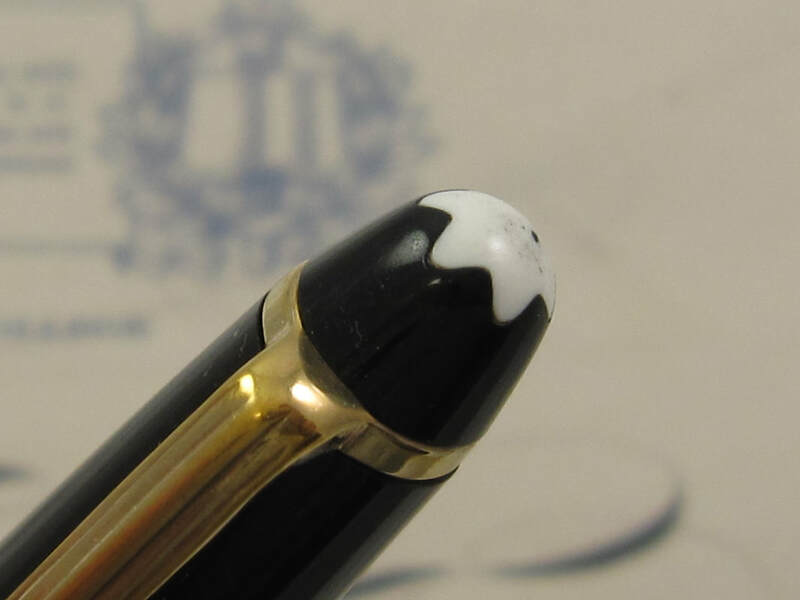 Fitted with its correct 14k monotone Montblanc 4810 nib that writes a medium/broad line. Professionally adjusted nib, ultra smooth nib, and a phenomenal writer. Plastic feed. 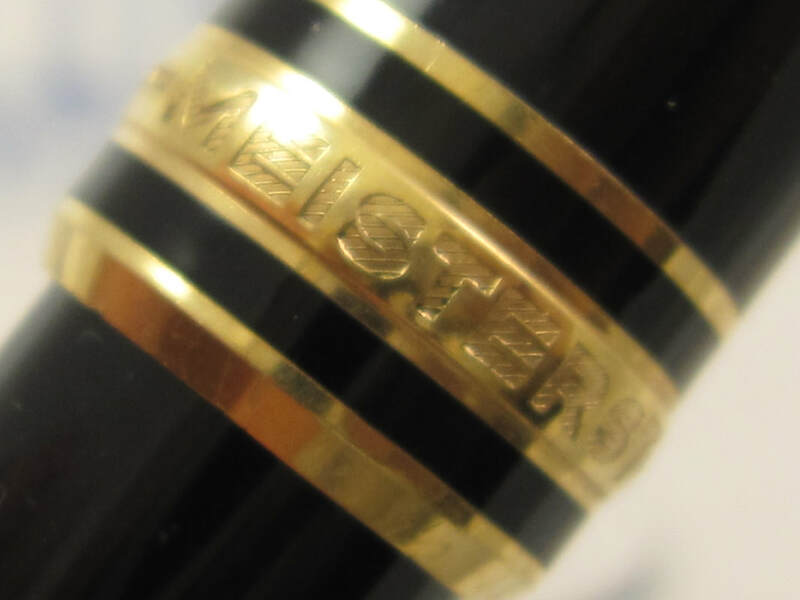 This pen is used, but other some gold plating wear in one of the section rings, it is in amazing condition. Cartridge converter filler. Converter included. Made in Germany. Current model in production. 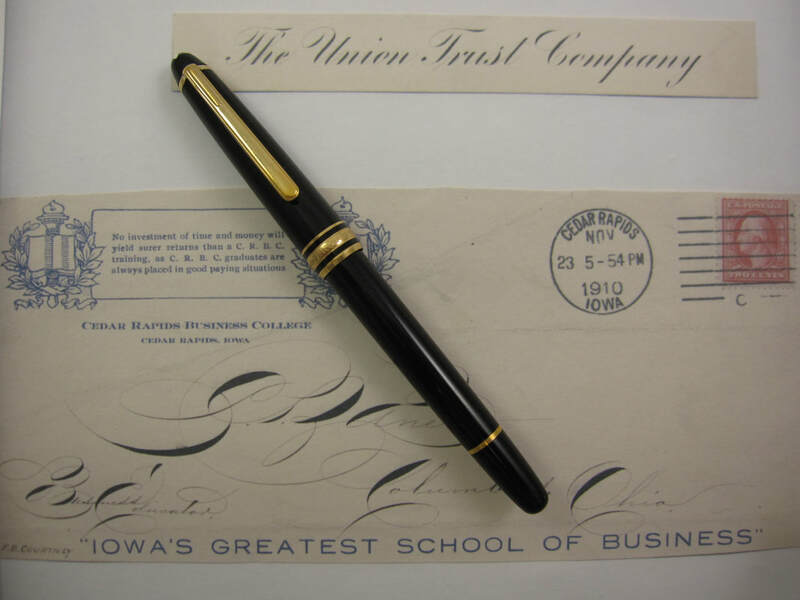 Current MSRP for this pen is $580. Get yours gently used for $295! 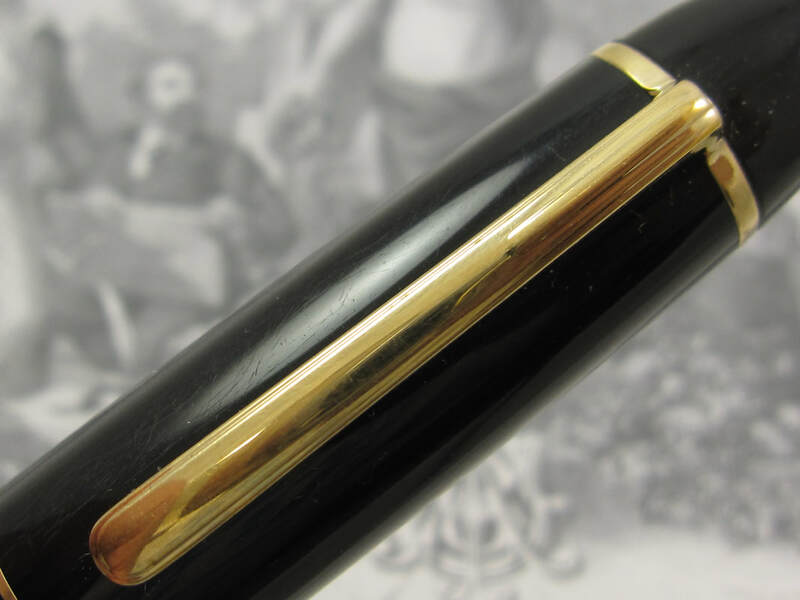 COMMENTS: Montblanc Classique fountain pen in black resin and gold trim. 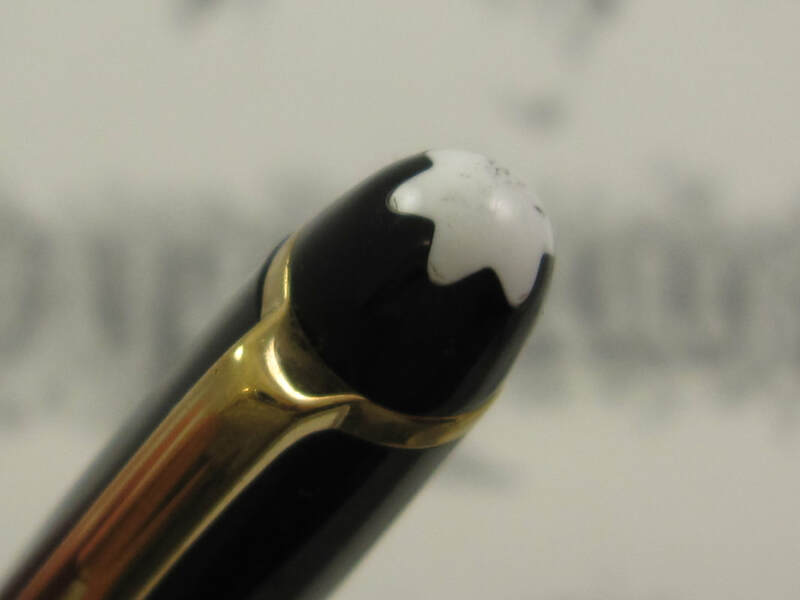 Fitted with its correct 14k monotone Montblanc 4810 nib that writes a broad line. Professionally adjusted nib, ultra smooth nib, and a phenomenal writer. Plastic feed. 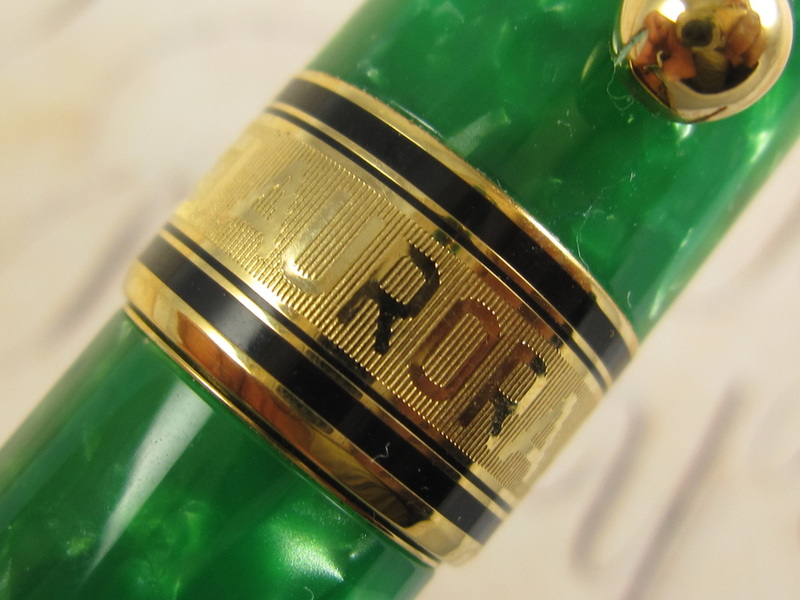 This pen is used, but other some gold plating wear in one of the section rings, it is in amazing condition. Cartridge converter filler. Converter included. Made in Germany. Current model in production. 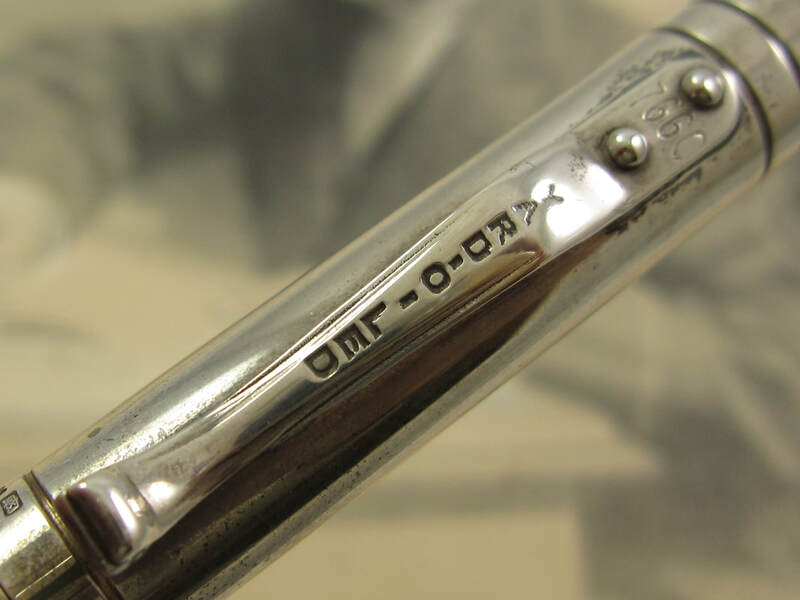 Current MSRP for this pen is $580. Get yours gently used for $295! 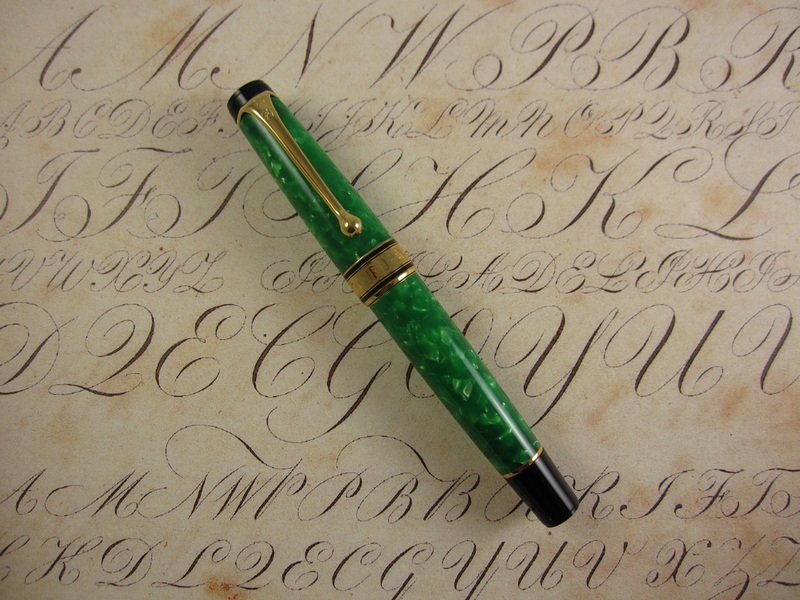 COMMENTS: Aurora Primavera Special Edition in marbled green celluloid and gold trim. Black ends. 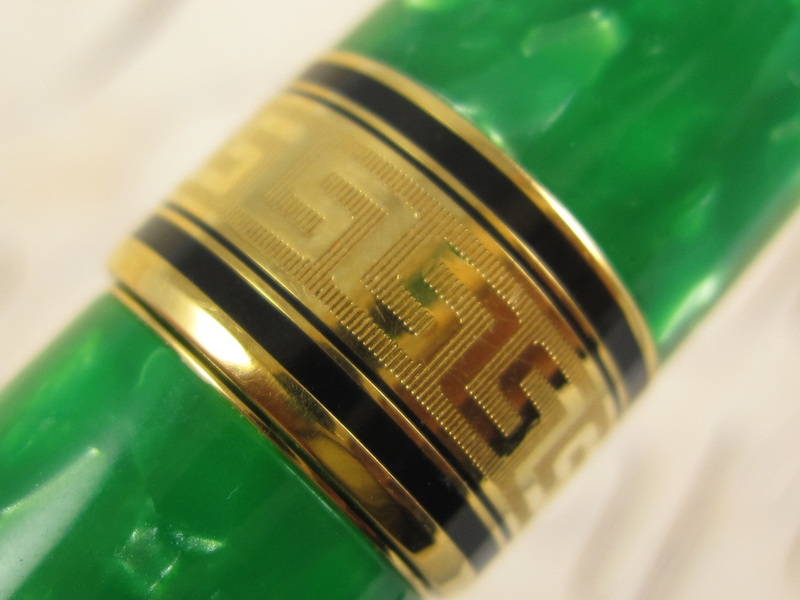 Cap has a wide gold band with the Greek key pattern. 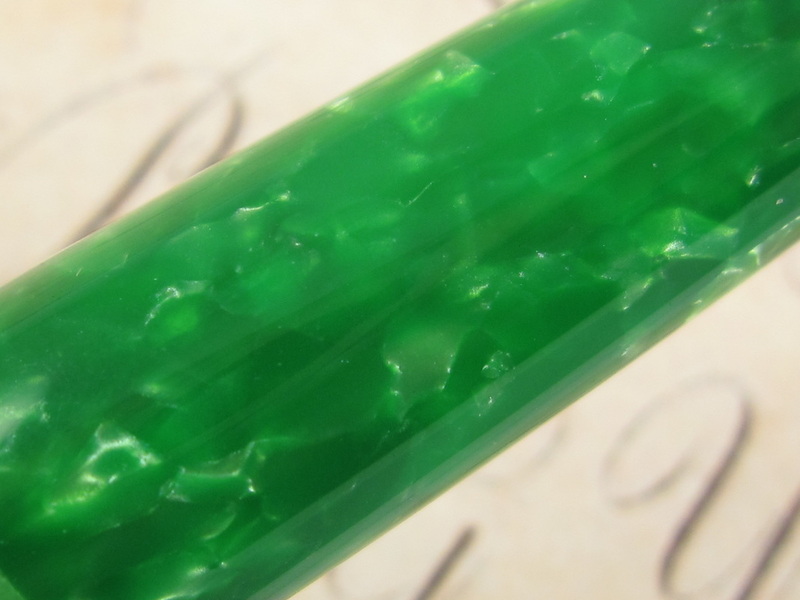 Clear window by the section, allowing to see ink levels inside the pen. 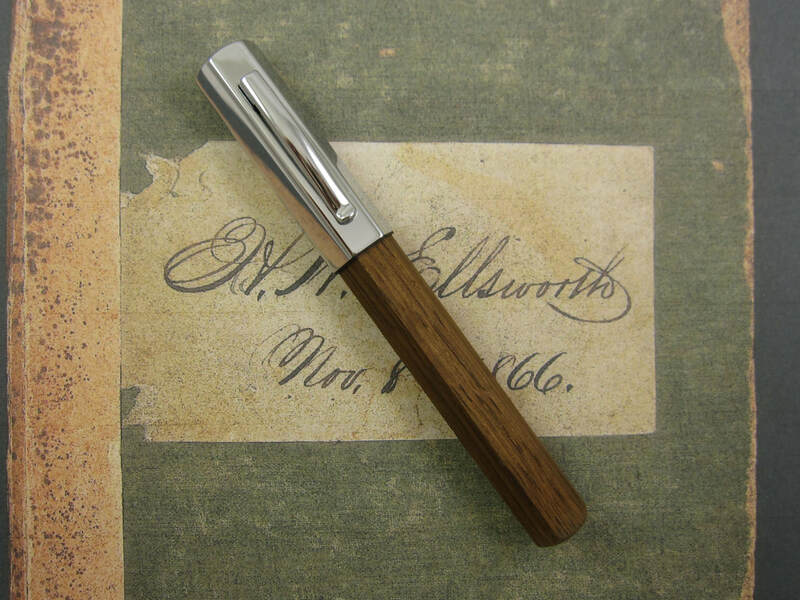 This limited edition version is based on the famous Optima series, which combine elegance with work horse capabilities for a fountain pen. 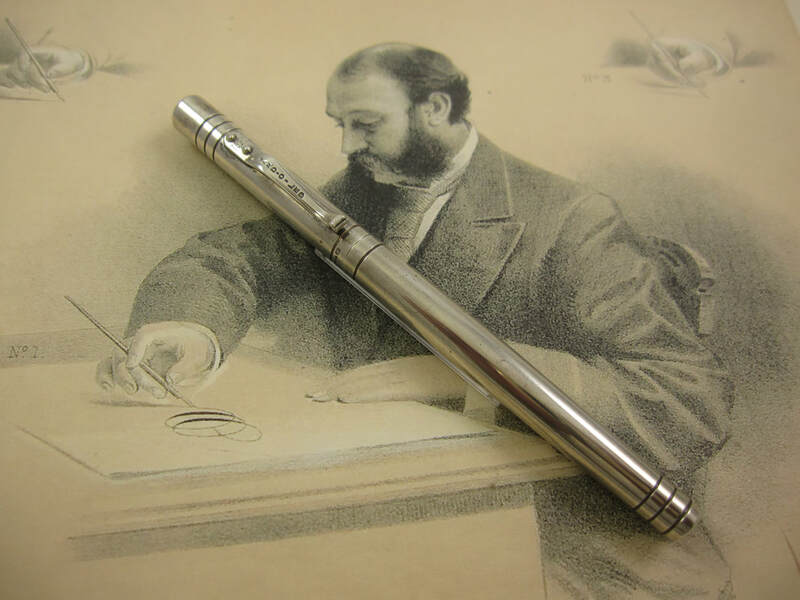 Personally, I think that the Aurora pen company is one of the very few pen manufacturers that has stayed truthful to their roots without compromising on low quality or with substandard product. I personally collect both, vintage and modern Aurora pens, and I love them. 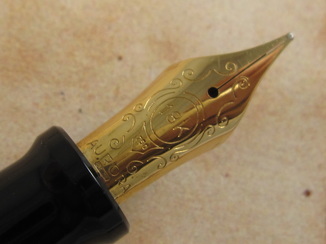 Fitted with its factory original and correct 18k monotone Aurora nib. It is a medium firm nib. Ultra smooth and a pleasure to write with. 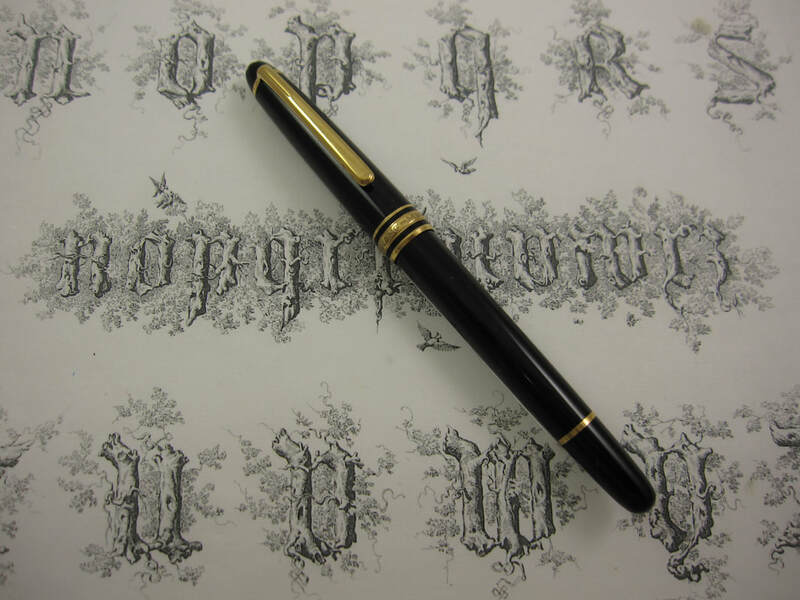 Amazingly beautiful pen and in near mint condition. Piston filler mechanism. Made in Italy in 1998. Limited edition model not produced anymore. COMMENTS: Delta Dolcevita Oversize with Vermeil trim. Solid black resin cap with marbled orange acrylic barrel. Wide raised ornate band on the cap. Roller ball clip type. 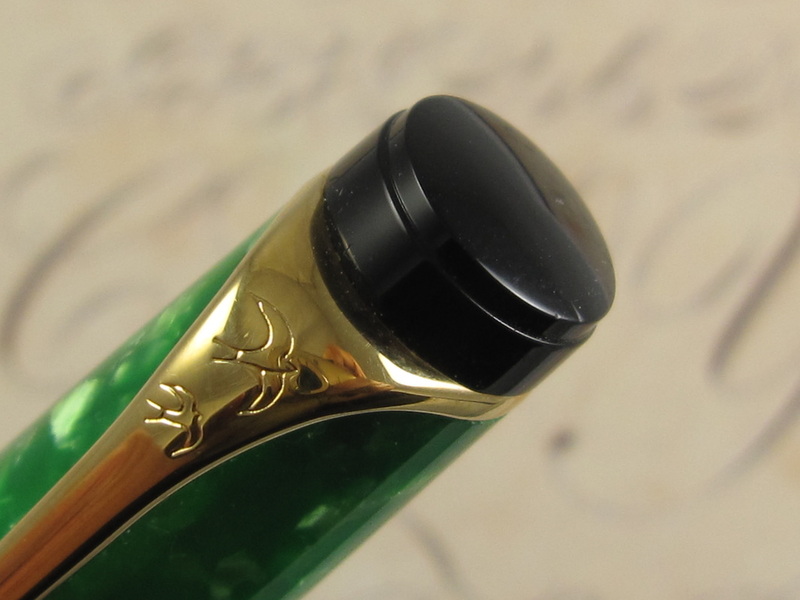 This is not only a massive sized pen, but it also exudes quality, style and elegance. 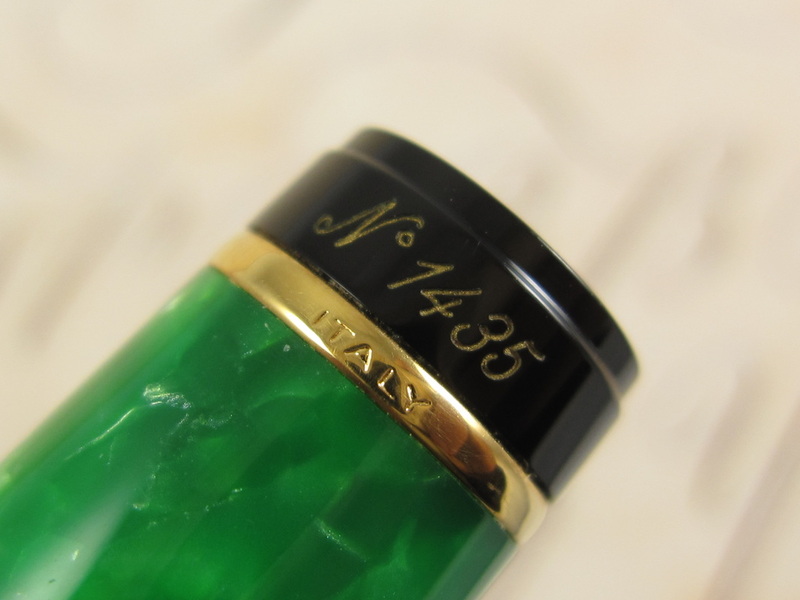 This pen is Italian style at its best. 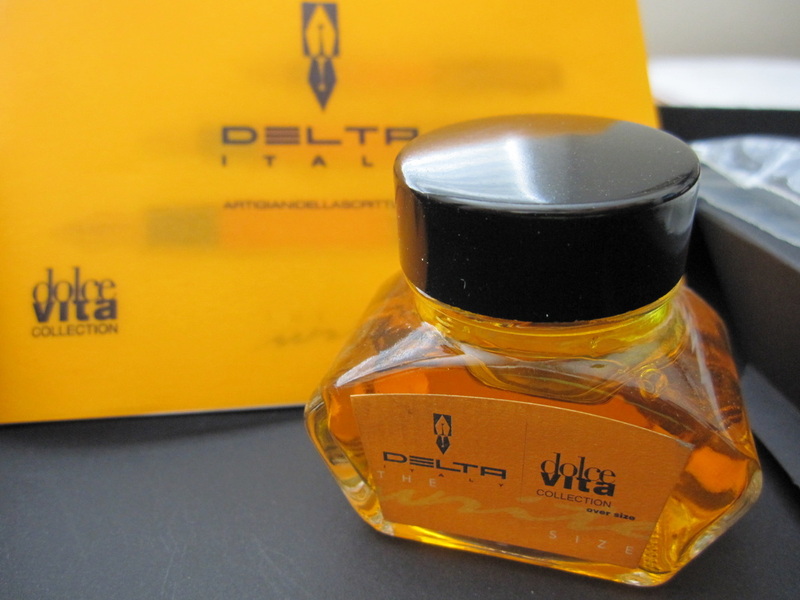 While most of the Dolcevita pens offered by Delta came with a hard-shell box, they also offer them in many other configurations. This particular one came as a huge gift-set lots of accessories. 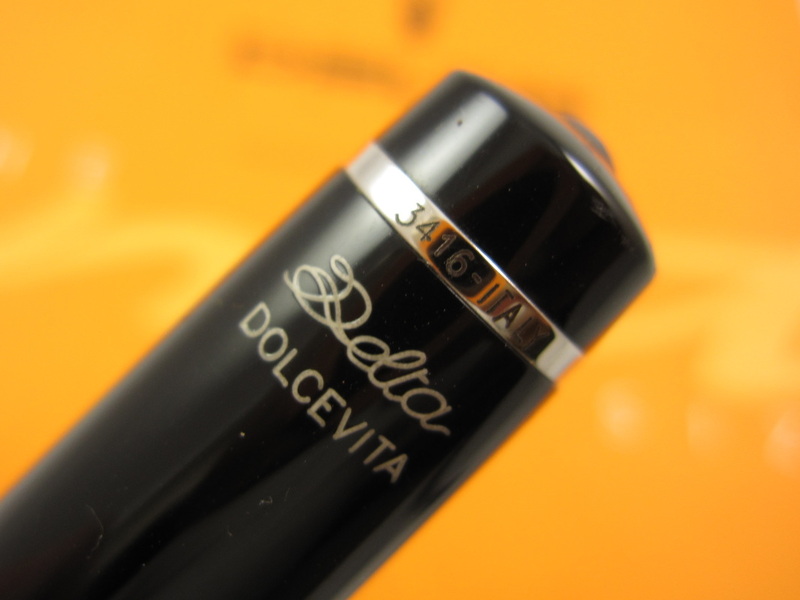 This is perhaps the largest gift set offered on a Dolcevita pen. The Delta company offered these pens in different configurations. 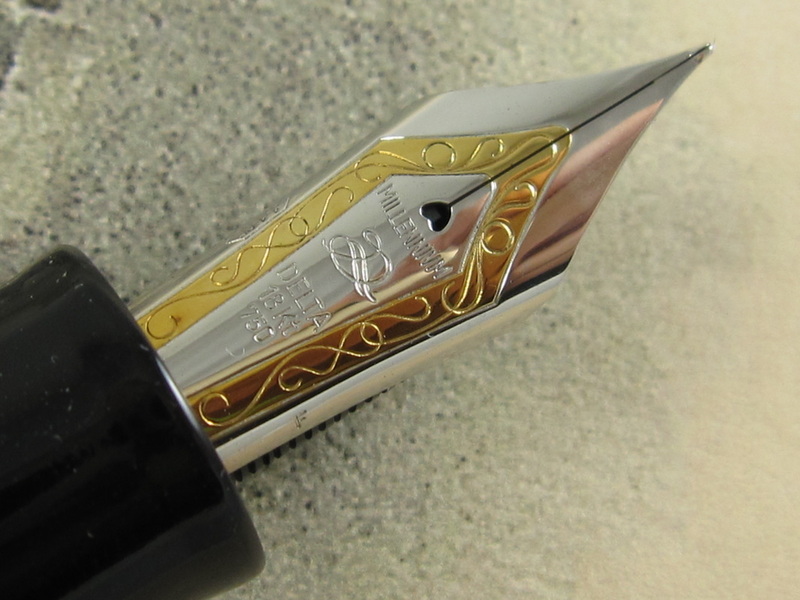 Fitted with its correct 14k platinum masked Delta fine nib. Ultra smooth writer. Pen measures 5 1/2" long (capped) and 7" long (posted). 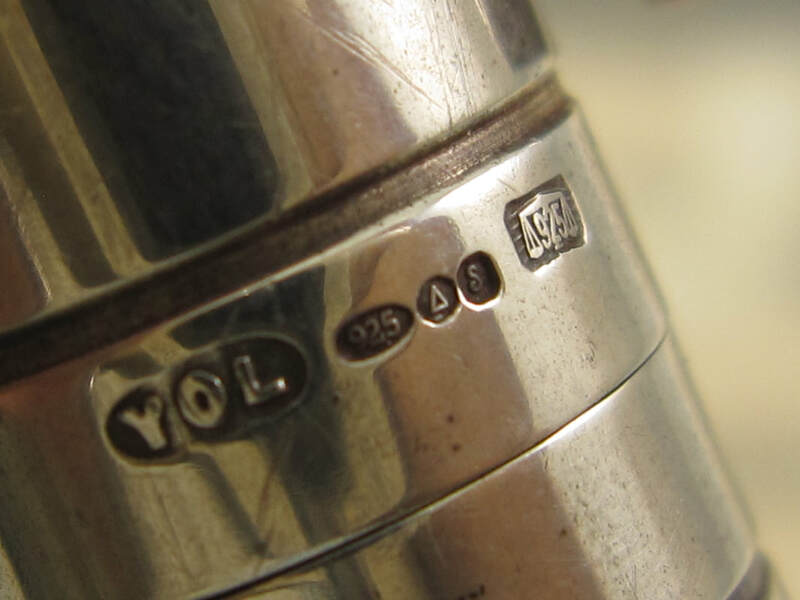 Diameter is 3/4". This pen has been filled a few times, but it is in near mint condition. Cartridge converter filler. 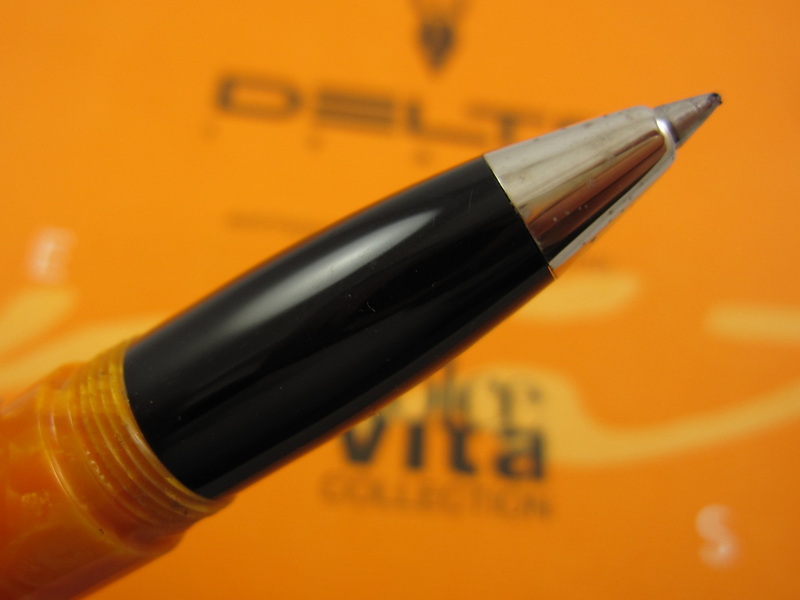 Delta indicates this pen can be used as an eyedropper, which will allow it to hold tons of ink. 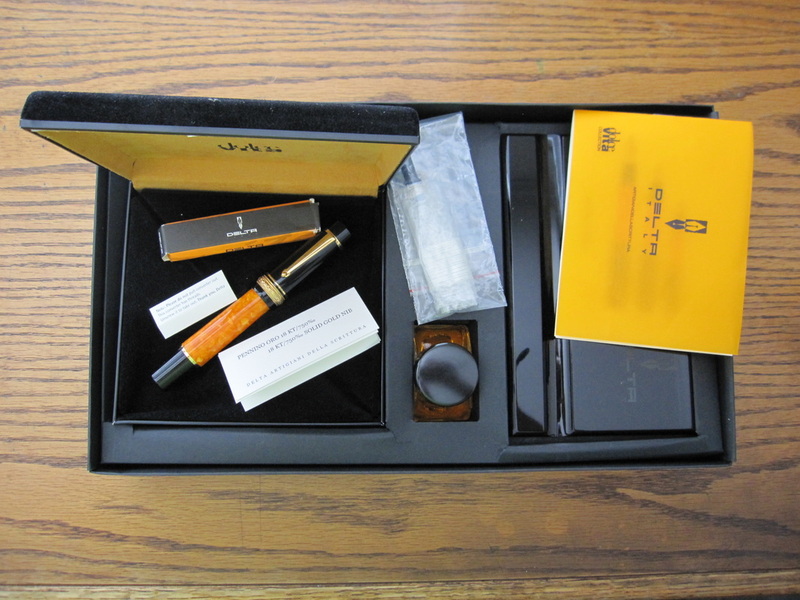 This gift pen set includes the following: Converter, black rectangular pen desk piece, bottle of ink, eyedropper, booklet, instructions as well as the inner and outer box. Made in Italy. 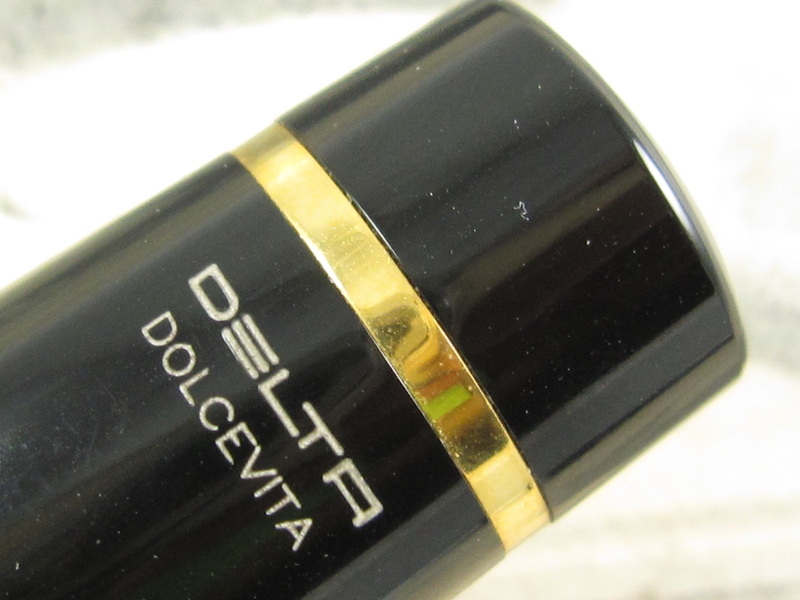 COMMENTS: Delta Dolcevita Mini roller ball with sterling band. Solid black resin cap with marbled orange acrylic barrel. Wide raised ornate band on the cap. Roller ball clip type. 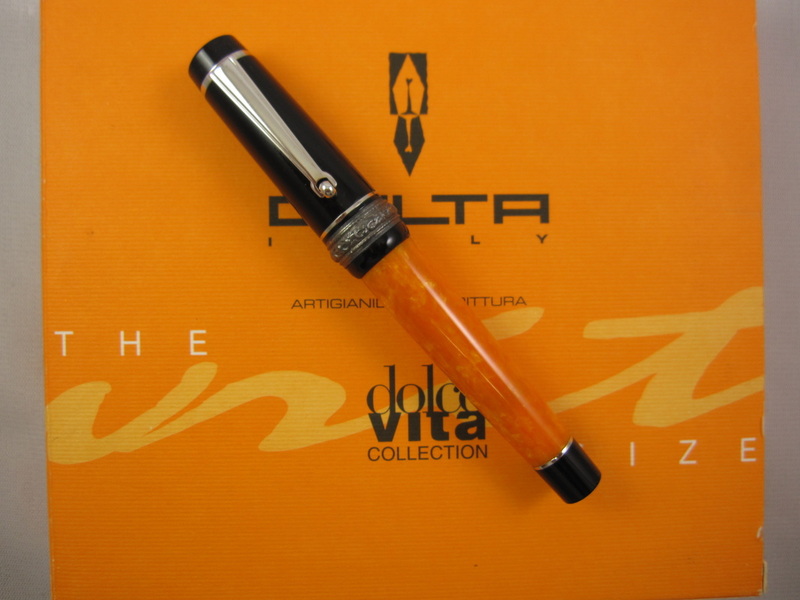 Delta Dolcevita pens exudes quality, style and elegance. 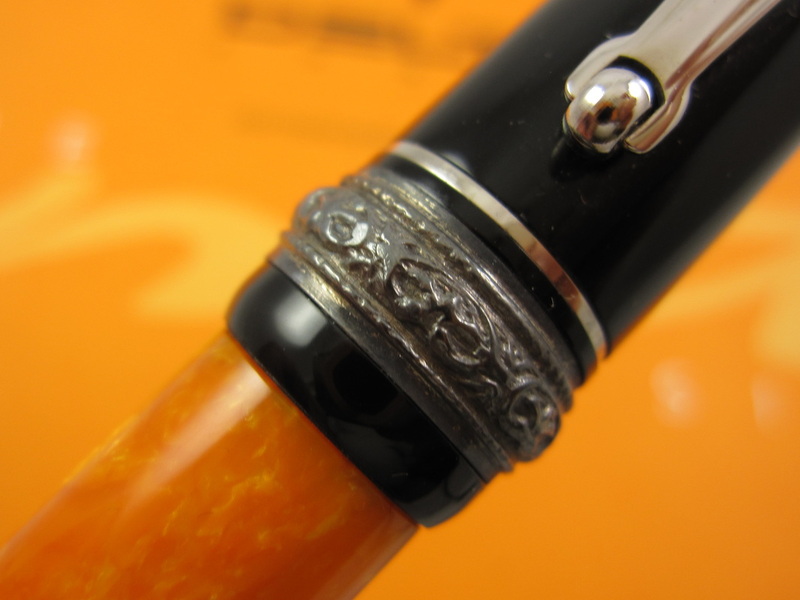 This pen is Italian style at its best. This particular pen came with a hard-shell box, an outer paper box, and papers. 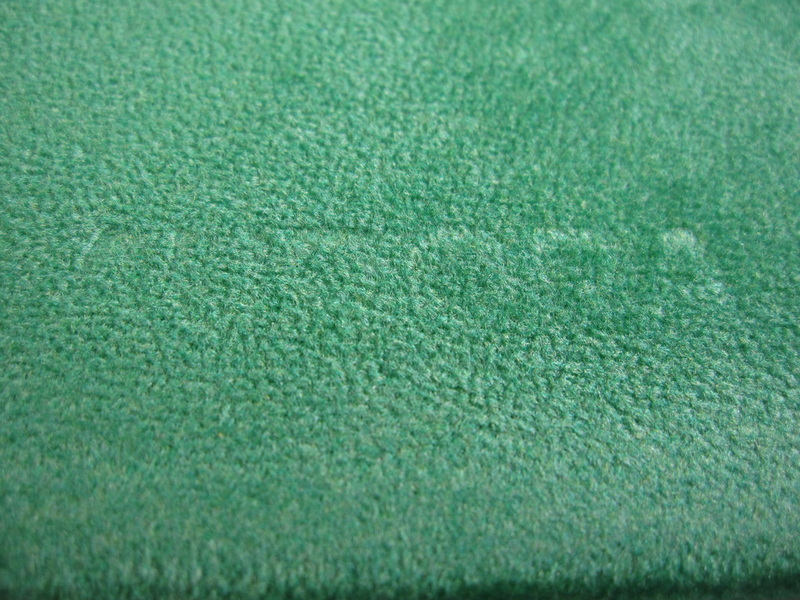 Pen measures approximately 4 1/2" long (capped) and 5" long (posted). It appears like this pen has hardly been used. Roller ball. Made in Italy. 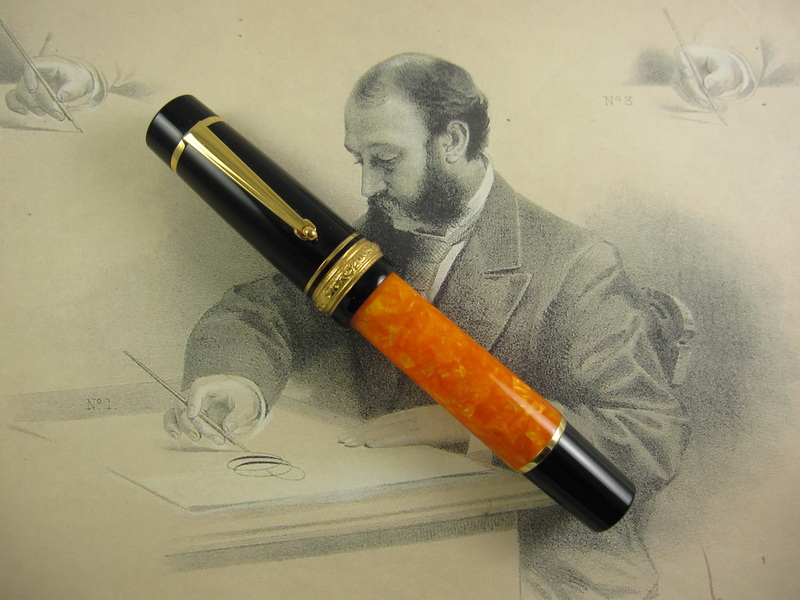 Current retail price for this pen is $325. 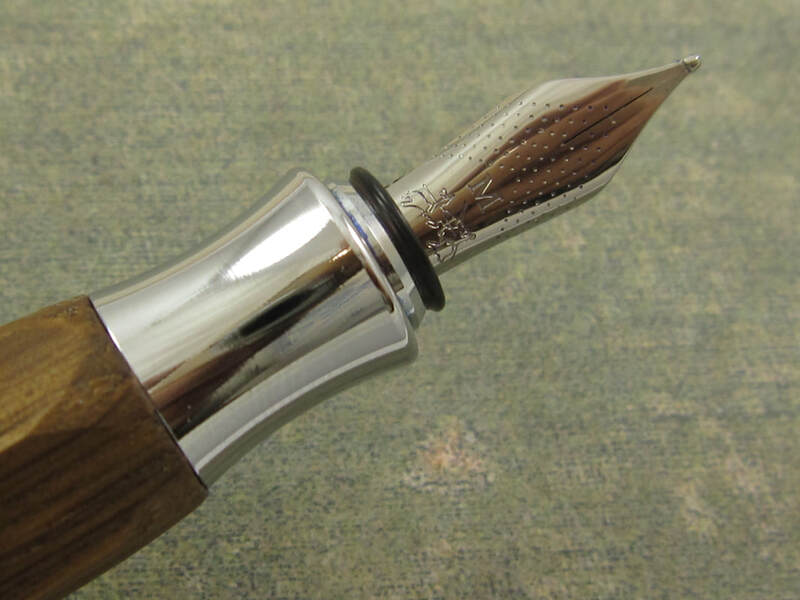 COMMENTS: Graf von Faber Castell Ondoro fountain pen with a barrel made of Oak Wood and a chrome plated cap. 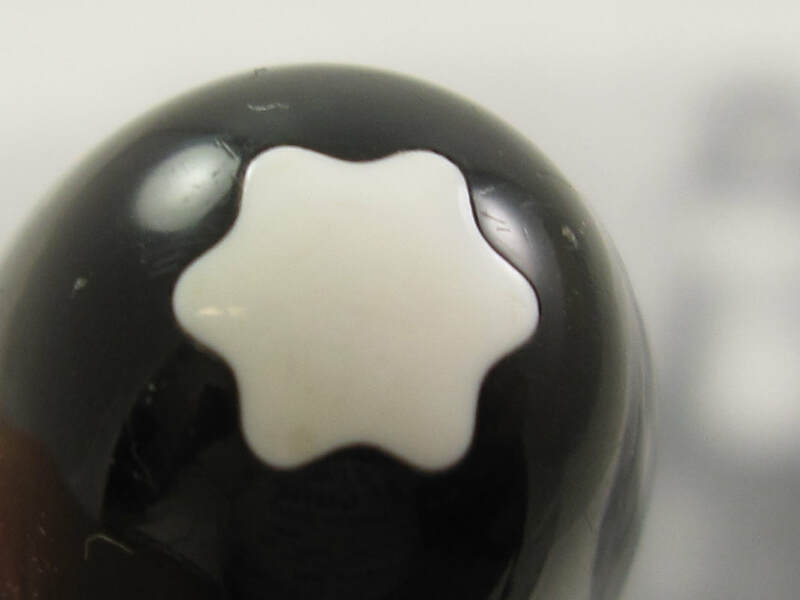 Hexagonal profile, which is the focal point of this pen. 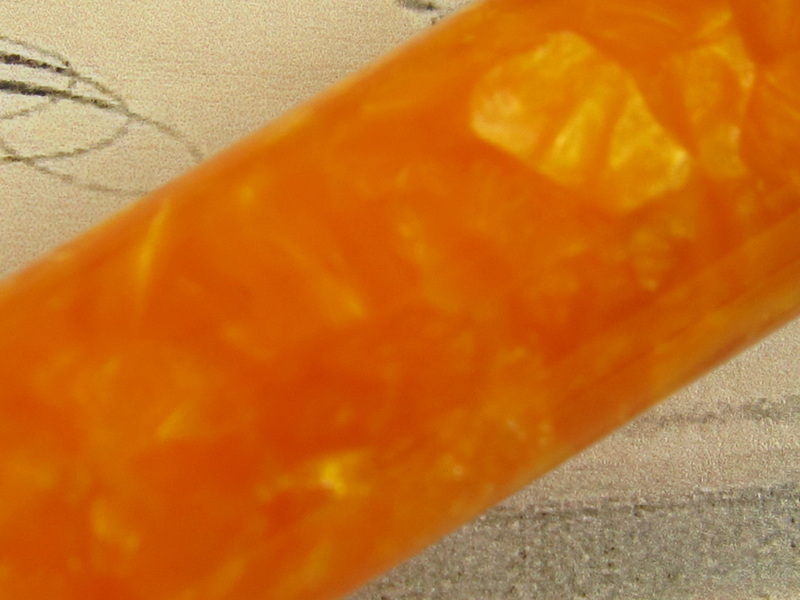 Wide girth (diameter). 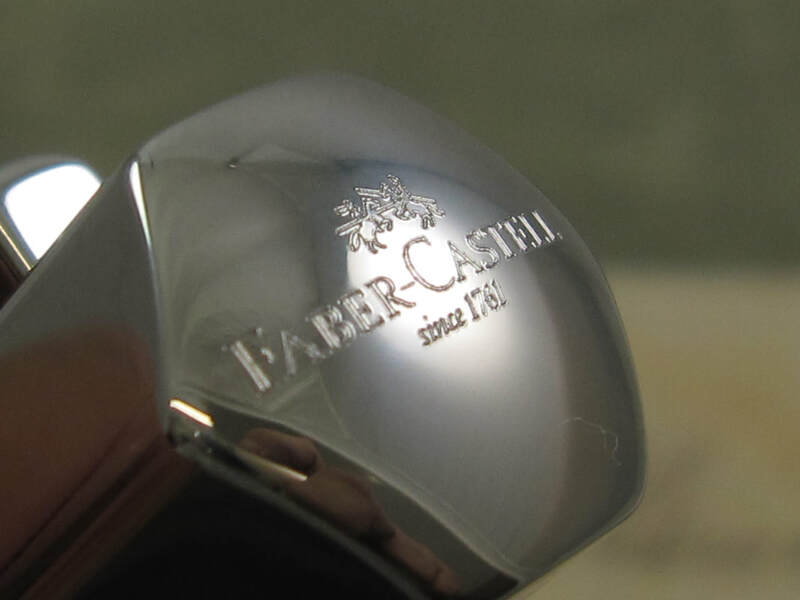 Fitted with its correct chrome plated Graf von Faber Castell medium nib. Ultra smooth writer. Ultra smooth writer. This pen is used but in near mint condition. Cartridge converter filler. Converter included. It currently retails for $165. Get yours gently used for $110. 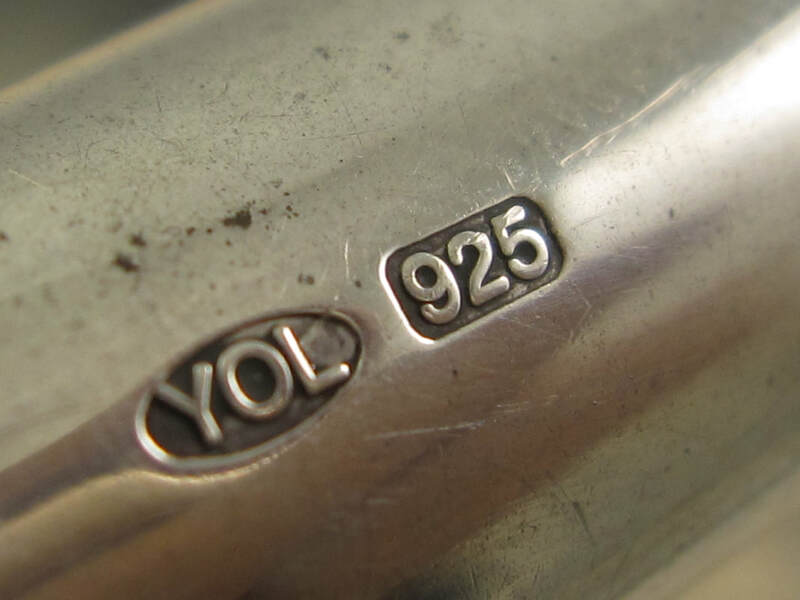 COMMENTS: Yar-o-Led Victorian Standard fountain pen in smooth sterling silver. 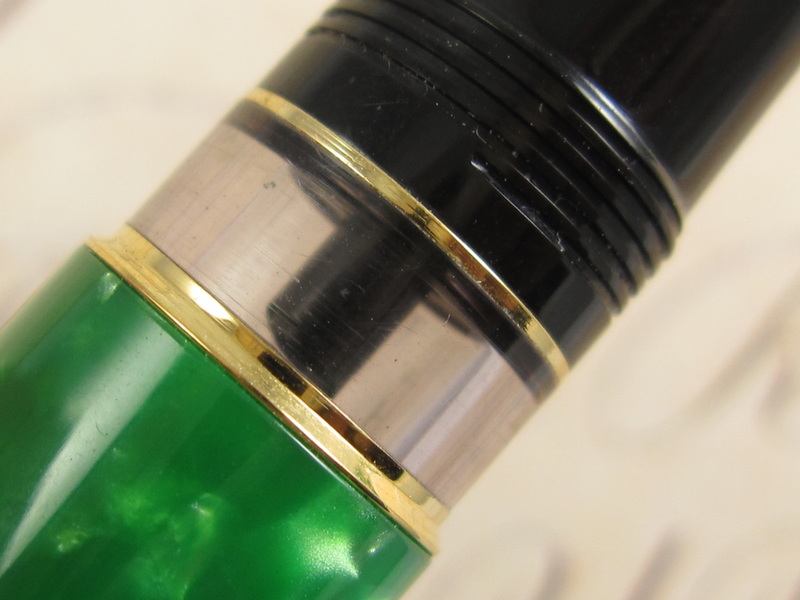 Yar-o-Led pens are true statements of British statesmanship. Very classy styles. They are fairly heavy pens due to the fact they are made of solid metal. 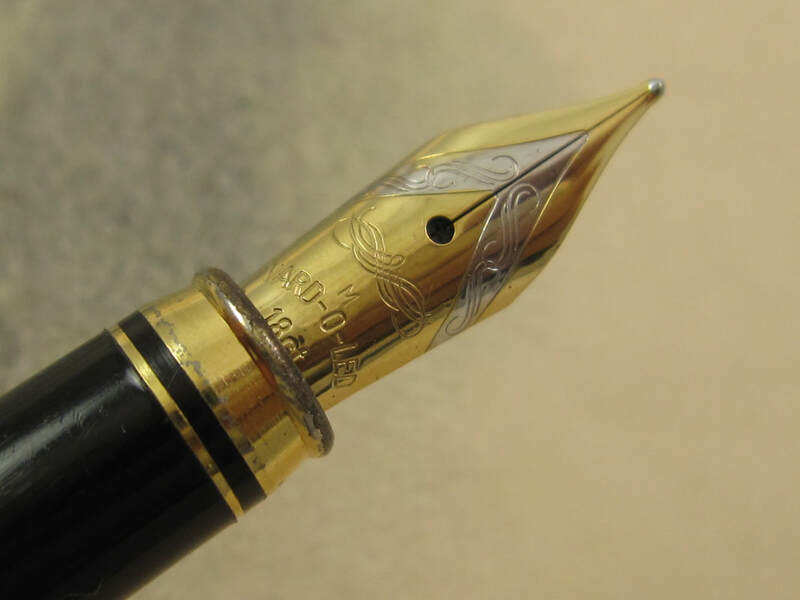 Wonderful pens and phenomenal writers. 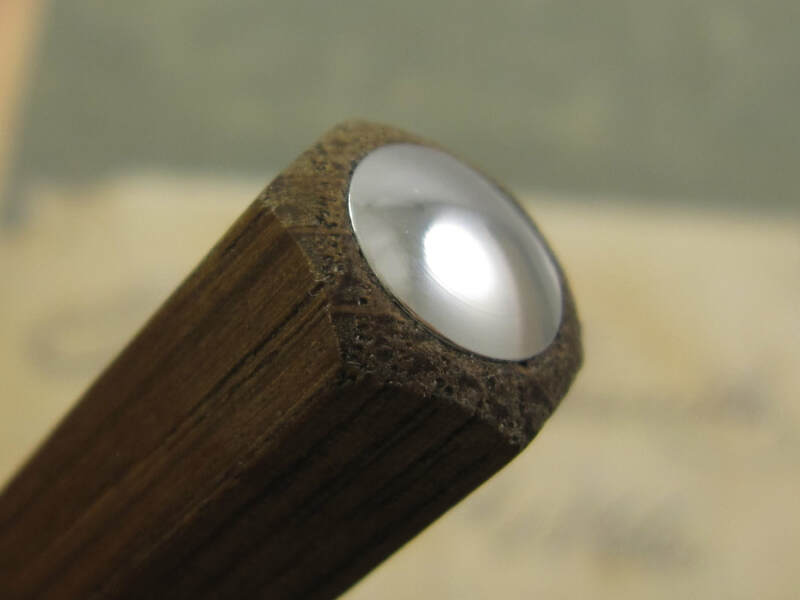 Fitted with its correct 14k monotone Yar-o-Led medium nib. 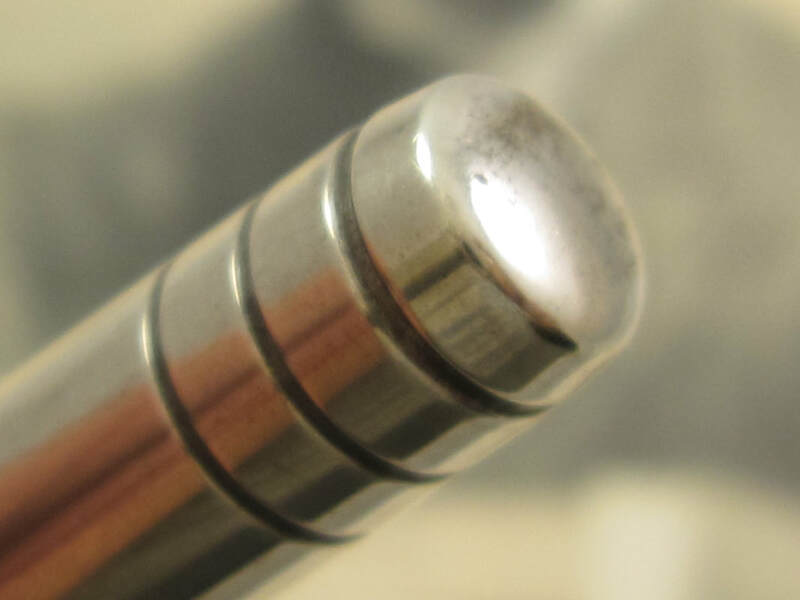 Ultra smooth nib. This pen is used but in awesome condition. 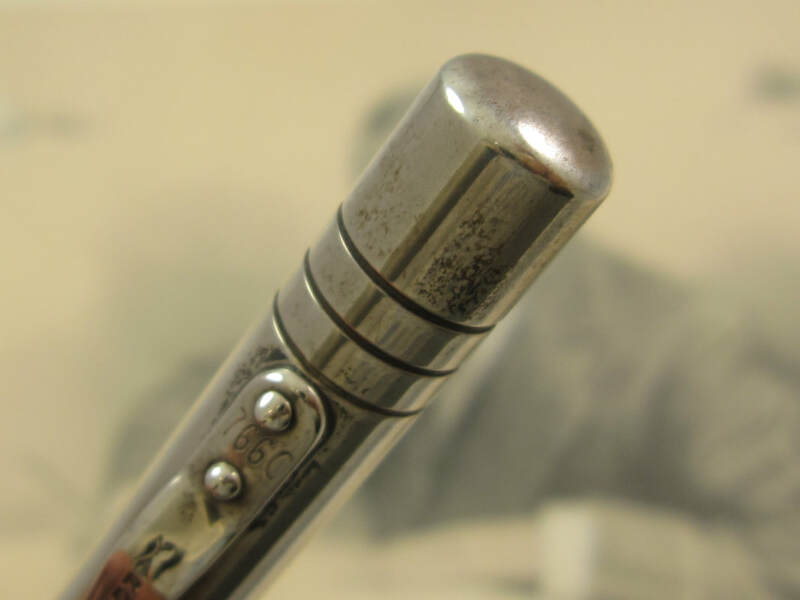 Some light scratches on its exterior, which is common in sterling silver pens. Cartridge converter filler. Converter included. It currently retails for $465. Get yours gently used for $340! with Aurora Talentum Fountain Pens and Ball Points. into a roller ball pen and vice versa in seconds with this section. 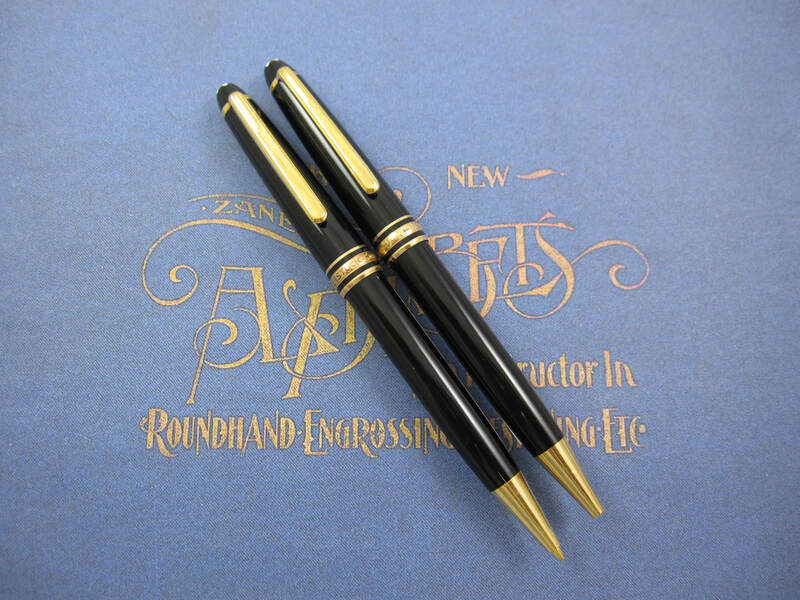 The current MSRP for one of these nibs is $475. Please take note I am selling the nib by itself. Nib unit is not available. 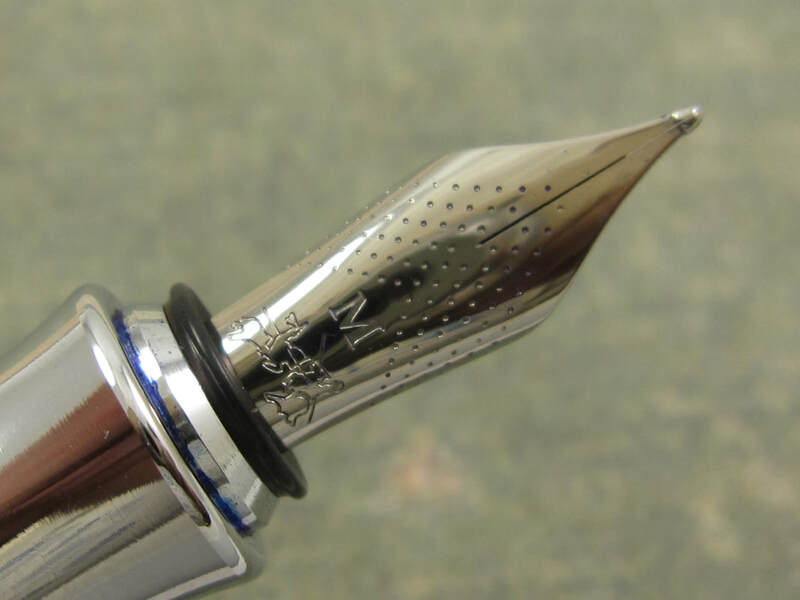 The current MSRP for one of these nibs is $350. Note: This clip does not have gold plating loss. shows ​a silver area with a black circle in the middle. ​Note: This clip does not have gold plating loss.